You’ll find Domaine Thibert next to the village square in Fuissé, a village with some 300 inhabitants right in the heart of the Pouilly-Fuissé appellation in the south of the Mâconnais area. Pouilly-Fussié is one of Burgundy’s largest village appellations, covering 757 hectares with an average annual production of 49, 930 hectolitres. Belonging to families of winegrowers for 7 generations, Andree and Rene Thibert created their own estate in 1967. Now their children, Sandrine and Christophe, have taken over the estate which comprises 28 hectares that spreads over the southern Maconnais. The vineyard is cultivated using sustainable agriculture methods to respect both the soil and the vines. The Champs Ronds terroir is located in the village of Leynes. The plot is on a plateau with a slight slope with a gradient of about 5%, which allows for better drainage, giving the grapes more concentrated aromas. The soil is gryphee limestone, gravel and sandstone. The wine ages for a total of 18 to 22 months, 11 of which are in oak barrels, the rest in stainless steel. The wine is bottled with little or no filtration. The bouquet is intense with charming citrus and floral aromas. 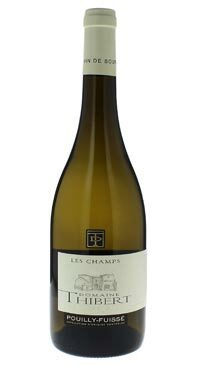 The palate is full and opulent while retaining that Saint-Veran elegance and freshness with lots of citrus on the palate and fine minerality.